Theoretically, simulated kinetic data were used to evaluate the performance of the linear, cubic spline and Bezier mathematic interpolations (in comparison with the physically meaningful tangential area-proportional interpolation) in case of the complex kinetics involving two independent processes with different degrees of overlapping. The Bezier interpolation exhibited best performance; the linear interpolation performed significantly worse than the two other ones. In general, the data distortions caused by application of the mathematic interpolations do not significantly influence the model-free kinetic parameters—apparent activation energy and pre-exponential factor; errors below 2% occurred even for the most extremely distorted data. On the other hand, the integrated peak area and the model-based parameters such as kinetic exponents and the complexity ratio can be significantly influenced by the interpolations-caused data distortions, with the associated errors being in the order of tenths of percent. 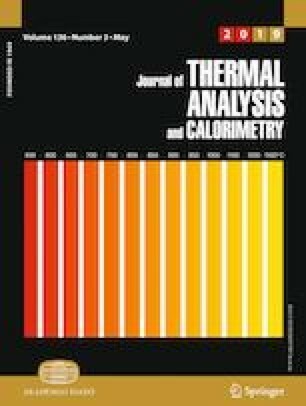 Nevertheless, the distortions associated with the choice of the thermokinetic interpolation were found to not affect the thermal stability predictions for the complex kinetic processes; only the precise predictions based on the mid-range degrees of conversion (e.g., controlled preparation of glass–ceramics) can be significantly affected by the incorrect interpolation of the thermokinetic background. This work has been supported by the Czech Science Foundation under Project No. 17-11753S.